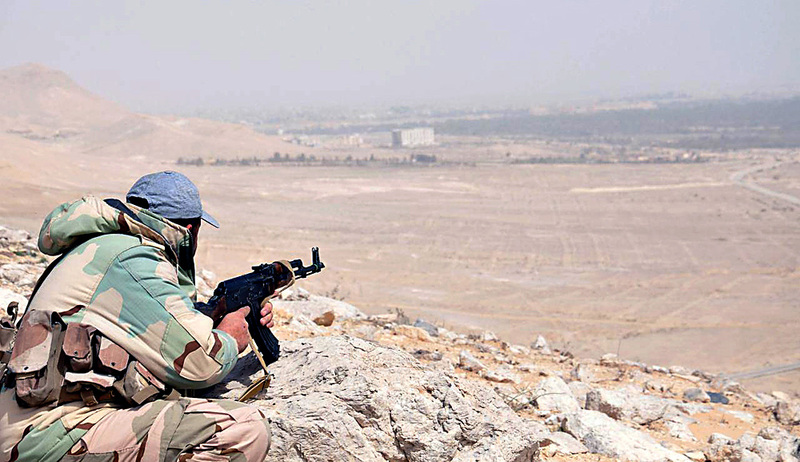 A member of the Syrian army taking position during an advance further in the vicinity of the ancient city of Palmyra, in central Homs province, March 24, 2016. A sixth Russian serviceman has been reported killed in Syria, as the Syrian army attempts to liberate the ancient city of Palmyra from ISIS control. Commenting on the death of the officer, military experts explain why Russian troops are still at risk. Despite the recent decision to withdraw the bulk of Russia’s forces from Syria, a sixth Russian serviceman has been killed during military operations, according to a spokesman for the Russian base in Khmeimim. "An officer from the Russian Special Forces died in the vicinity of the Tadmor settlement (Palmyra, Homs Province) while on special assignment guiding the strikes of Russian planes onto ISIS targets,” RIA Novosti cites the spokesman as saying on March 24. “The officer was carrying out a combat assignment in the neighborhood of Palmyra for a week, identifying important ISIS sites and giving precise coordinates for the Russian planes to launch their strikes," he said. Commander of the Russian contingent in Syria Colonel General Alexander Dvornikov had announced only on March 23 that Russian special forces were operating on Syrian territory, conducting reconnaissance missions for aviation strikes and guiding airplanes. Retired colonel Vladimir Anokhin, vice president of the Academy of Geopolitical Issues, who in the Soviet period carried out combat missions in Syria, explained why servicemen assisting the air force to identify targets are in a vulnerable position. "Such an officer is present in the combat formations of the attacking forces and directly adjusts the aviation's aim onto the targets that must be destroyed,” Anokhin told the Vzglyad newspaper. “This all takes place very close to the contact line between the sides, which is why the officer is subject to enormous danger," he said. “This is always a very dangerous profession. The risks are very high and the people who do this work realize that they may lose their lives at any moment if their position is discovered," he said. The special forces officer died in the vicinity of the ancient city of Palmyra, where intense battles with ISIS militants have been raging for the last several days and the army of Syrian President Bashar al-Assad is gradually regaining control of the city that it lost last summer. Soldiers from the Syrian government forces and the Desert Falcons militias stormed the Palmyra citadel on the morning of March 25, reported RIA Novosti. The militias have dug in at the top near the mobile communications tower, 600 meters from the fortress, and advancing units are entering the citadel from various sides, under the protection of mortar fire. Aviation and heavy artillery are not being used in order not to damage the World Heritage Sites nearby, reported RIA Novosti.